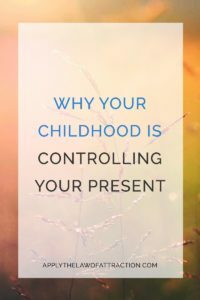 What if I told you that things that happened in your childhood…things told to you by your parents, teachers, and friends were controlling you today? Usually by parents, mentors and friends who may not even realize what they’re doing. The most dangerous thing about them? They work in the background like a computer virus, so you don’t even know they’re there or how they’re holding you back from achieving your highest potential. The first step to overcoming these imprints is to know what they are. – In just 30 seconds. Click here to take Natalie’s new quiz & find out what’s sabotaging your success and abundance today! When I took the quiz, it brought me face-to-face with my past, or rather with the parts of my childhood that were holding me back. All these events formed an imprint in my mind which affected my thoughts, actions, and beliefs without my realizing it. There are FOUR types of blocks that affect everyone in different combinations. Take the quiz and find out what’s sabotaging your success & abundance right now. It's time for you to be free from the childhood imprints holding you back in wealth, career, and life.